One of the problems we have as a society anymore, it seems, is manners. Or, better yet, the lack thereof. When addressed with a question by someone, very few people reply with, “yes sir,” or “no ma’am.” When we ask someone to do something for us, rarely do we end with the phase with, “please.” Most of all, the world never, ever, ever responds with a collective “thank you,” for a job well done much any more. I guess we come to expect all things to be done great, all the time, without hesitation, no matter the circumstances. Today, most people would rather replace the first word in the phrase “thank you,” with something more vulgar and direct. Four letter-words were made famous by George Carlin. But that doesn’t mean that they should replace human decency and appreciation. 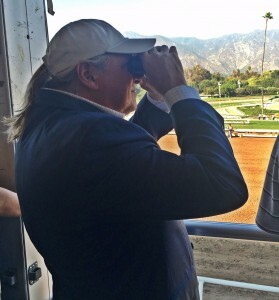 So, it is with those thoughts in mind that, for one, I would like to thank Churchill Downs. Without the company, the track and its wonderful, professional staff, the Kentucky Derby would be an impossible production that benefits the entire Thoroughbred industry and every individual that has anything to do with it. Just as importantly, though, without Churchill Downs, the world would not see the beauty, pageantry, magical scenes of Kentucky and its people in all of its glory. So, thank you, Churchill Downs, for being the only place on Earth – in any sport – that can host a crowd of about 25,000 on Wednesday, approximately 50,000 on Thursday, over 100,000 on Friday, and, then 150,000-plus on Saturday. The track features amenities that most venues wouldn’t be able to offer: seating accommodations that are freshly dusted (this year, I guess the term would be mopped), bathrooms that are clean and stocked, food and beverage stations that are fully operational, beverage vendors with full trays of your favorite drink, ushers and attendants that are warm and welcoming. Can you imagine if the NFL had to replicate the Super Bowl on three straight days? Can you imagine the NCAA trying to do the football championship on back-to-back nights? Or, the Final Four championship game three nights in a row? Thank you, Churchill Downs, for having betting windows open in every venue, in every possible location, in every nook and cranny so that we all can put down a friendly bet. Thank you, Churchill Downs, for working so closely with AT&T over the past two years to increase the bandwidth and depth so that you can make calls, send text messages, pictures and use social media at light speed, and make your bets with TwinSpires without hesitation or delay. Lots of money and effort have been spent to make this a reality. Can’t do that at a concert at the Yum! Center. Thank you, Churchill Downs, for making the backside of the racetrack more accessible to fans and tourist groups, so they all can get a close-up glimpse of the greatest collection of 3-year-old racehorses in the world, and a better idea of what happens every single day to put on the Greatest Show On Earth (with all due respect to Ringling Brothers and Barnum-Bailey). Thank you, Churchill Downs, for installing the world’s largest outdoor high definition TV screen, so that you can see the full run of the Kentucky Derby from nearly every seat in the house. No other track in the world has anything close to that, where every pixel counts. Thank you, Churchill Downs, for all your additions and amenities that you installed for the owners of Derby horses. Never had the chance to enjoy the old area or the new location just outside the winner’s circle (yet, but hope does spring), but everyone who has been there gushes about the improvements. Thank you, Churchill Downs, for the upgrades to the Turf Club, and the millions that you have spent on the first class accommodations upstairs. No sporting venue in the world can come close to the amount of luxury boxes and seats that you provide, and the care you receive from the staff once you are on location. Zero. Thank you, Churchill Downs, for anticipating a flash flood and preparing for the worst weather in years. Despite all the rain, fans and guests alike managed to enjoy great racing. In other words, intolerable weather conditions – which I still think is in the control of someone other than you — did not ruin the days, the experiences and the memories of a lifetime. Thank you, Churchill Downs, for employing the best track superintendent and crew that not only take care of the track to ensure its safety during the races, but also do it every morning so that all horses stabled on the backside can continue their normal routines and training regimens. You talk about work? That is work. Thank you, Churchill Downs, for having the best gate crew in the world. Where else could you have a 20-horse field, loaded into two starting gates, and still have a safe and orderly process? No other track would even try. And, thank you, Churchill Downs, for employing gate professionals. I didn’t witness one gate crew member using a buggy whip, or one gate crew member grabbing a horse’s ear to try and “encourage” them into the starting chute. For the record, horses don’t like either. Maybe some other tracks can take note. Thank you, Churchill Downs, for working with Mayor Greg Fischer and his fabulous staff leaders and departments for improving traffic flow both into and out of the Churchill Downs area. I went to the George Strait concert in Dallas a couple of years ago and I just now got home. Thank you, Churchill Downs, for making the 143rd running of the Kentucky Derby the safest event in history. Despite a muddy track and periodical rains, the track was in great condition; although some would argue a little biased towards speed. The only hiccup was when Thunder Snow exited the starting gate like a rodeo horse and tried to buck his way to the winner’s circle. Yet, neither he nor rider was hurt in any way, and PETA limped back home without anything to cry about. Thank you, Churchill Downs, for the roses so red; a winner’s circle so happy; and Twin Spires that still stand the test of time, which remind us all that Kentucky is a special place to live. It’s too bad that others have not joined in to thank you, Churchill Downs. Seems like the only “news” that makes it to the front page anymore has to have something bad attached to it. And, despite the fact that The Lexington Herald-Leader was once again fixated on pictures of a muddy infield party rather than the glory of the sport, you shined bright on OUR collective Kentucky home. A few years ago, the media jumped on you, Churchill Downs after negative comments made by Perry Martin and Steve Coburn. It didn’t take either one of those fine gents to show their true colors. Yet, no apologies to you. All you did was make the Derby experience better. For all of us. Thank You, Churchill Downs, for your perseverance. Once, after waiting an hour for the opportunity to purchase a soft drink (I only drink Coca-Cola products, by the way), some chicken bites, fries and other health food items for a mere $72.36, I was given that gracious salutation from a smiling mermaid. On the other hand, Churchill Downs does. Thank God. And, thank you Churchill Downs.